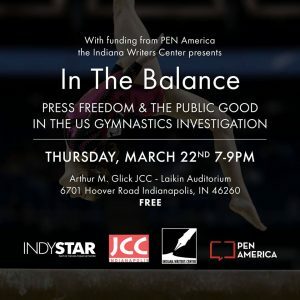 With funding from PEN America’s Press Freedom Incentive Fund, the Indiana Writers Center will present “In the Balance: Press Freedom & the Public Good in the USA Gymnastics Investigation.” John Krull, the chairman of Franklin College’s Journalism Department and host of the WFYI show No Limits moderated a panel featuring Tim Evans, Marisa Marisa Kwiatkowski, and Mark Alesia, the Indianapolis Star journalists who investigated and wrote the stories about widespread sexual abuse in the USA Gymnastics organization. Other panelists included Steve Berta, editor for the series; Robert Scheer, visual journalist, and Gerry Lanosga, professor of investigative journalism at Indiana University. 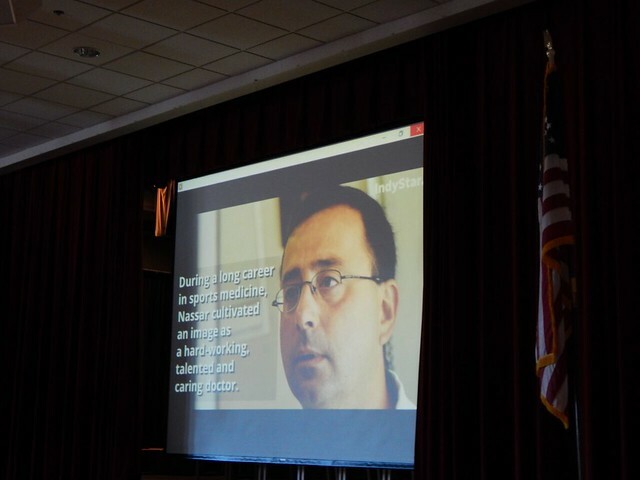 Among the top award winners in the 2016 Investigative Reporters & Editors contest, which recognizes the best watchdog journalism of the year, the Indy Star series was instrumental in the recent conviction of Dr. Larry Nassar, the resignation of USA Gymnastics board members, and the resignation of the president of Michigan State University, the athletic director, and other staff.